There are several realities that have enabled this dramatic growth including the accessibility of wearable devices and the decreasing costs of sensor technology. Now that most consumer mobile devices are equipped with Near Field Communication (NFC) and Radio Frequency Identification (RFID) tags, they can communicate with IT systems. In addition, the rates of chronic diseases are on the rise and the demand for better treatment options and lower healthcare costs makes it more appealing to dabble with new innovations that could provide better healthcare outcomes and efficiencies. High-speed internet expansion and access, as well as favourable government regulatory policies, have also contributed to the growth of IoMT adoption. IoMT can provide a better way to care for our elderly and has a tremendous potential to help deal with the rising costs of care. IoMT devices can help track vitals and heart performance, monitor glucose and other body systems, and activity and sleeping levels. Seniors often forget to take their prescribed medication on time, and IoMT devices can help remind them to take it and document what time they took medication. Additionally, portable diagnostic devices can make routine blood and urine tests easier on our aging population—a group of individuals where mobility is more challenging and who need to complete these tests more frequently than for younger patients. Portable diagnostic devices can analyse and report the findings of these tests without requiring a visit to the doctor’s office. There is a lot of opportunity for IoMT things to help remote caregivers ensure the safety of their loved ones with wearable devices that learn the regular routines of the person who wears the device and can issue a warning if something seems amiss as well as alert if seniors have breached their boundaries which is often of concern for memory-care patients. While you might think that IoMT would help diagnose patients, currently the biggest use—and impact—of IoMT is to ensure adherence to doctor’s orders. IoMT isn’t intended to replace healthcare providers but to provide them with the data gathered from devices for better diagnoses and treatment plans as well as to reduce inefficiencies and waste in the healthcare system. 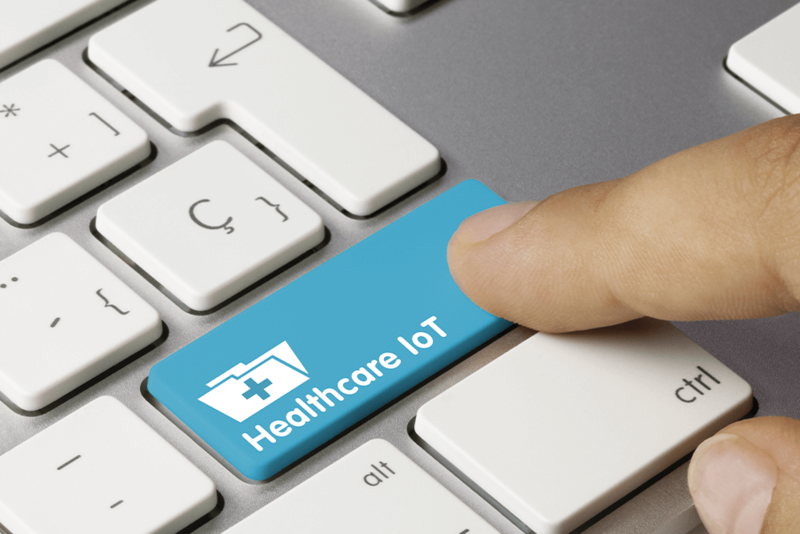 Healthcare facilities also currently use the Internet of Things to help with workflow optimisation, inventory management and medical device integration. A connected medical device provides objective reporting of actual activity, whereas without its reporting providers must rely on subjective patient reports to detail how they feel. Similarly, IoMT devices help to monitor patient behaviour and activity away from the office, so the provider will have actual data to refer to regarding compliance to patient therapy recommendations and what transpires after a patient leaves a medical facility. From creating customised pharmaceuticals to determining care guidelines based on the unique biological systems of a particular patient, IoMT opens the door to more personalised healthcare for each individual. As the number of connected devices increases IT systems will need to determine how to handle the data load securely. In order for the IoMT things to truly be transformative, healthcare organisations will need to figure out how to turn all the data it collects into insights that can inform action. While the momentum of this transformation is increasing, it will require hospital administrators, manufacturers and vendors to work together to drive healthcare’s cultural metamorphosis.